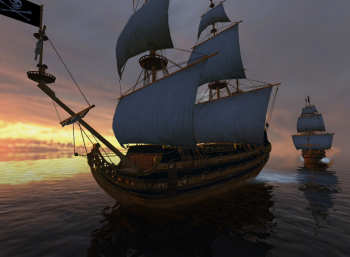 Snowbird's latest wargame sim will crown you pirate king. Snowbird Game Studios, the fine folks behind skirmish combat sim Mount & Blade's With Fire and Sword expansion, has announced that its latest venture will take you to the Golden Age of Piracy. In Carribbean! you'll be coasting between the reefs looking for fat merchantmen, raiding coastal towns, and splicing main braces with the best of them. No word yet on the scurvy, but given the developer's commitment to realism it may be a good idea to stock up on limes before you set sail. The developer promises a game filled "with spectacular and brutal sea battles, boarding fights, duels, political intrigues and, of course, piracy," all controlled by the Fire and Sword game engine. It will feature real time combat, with bloody boarding battles on the poop deck and spectacular cannon duels. Ships aren't your only target, as you'll also be capturing forts, harbours and coastal towns in your ongoing quest to become the terror of the high seas. There's also a fair amount of management, by the look of things. Mount & Blade was ultimately just you against the world, but this time out you have a ship - or even a fleet - to command, with all the customization and time-consuming detail that this can involve. There will be a multiplayer mode featuring both sea and land battles, and what's described as a "complex siege system" for those occasions when the enemy discourteously decides to hold out rather than hand over the loot as soon as you show up. It won't be long now before you can see for yourself. The PC release is scheduled for Autumn 2012.